Preheat oven to 375 degrees F. Line a baking sheet with foil and lightly coat with nonstick cooking spray. In a medium bowl, toss strawberries with coconut sugar so that they are fully coated. Transfer to prepared baking sheet and arrange so that they aren’t crowded. Bake for 20 minutes or until berries are juicy. Heat a skillet over medium high heat. Lightly brush or drizzle half of olive oil over two slices of bread and place oiled side down in a skillet. 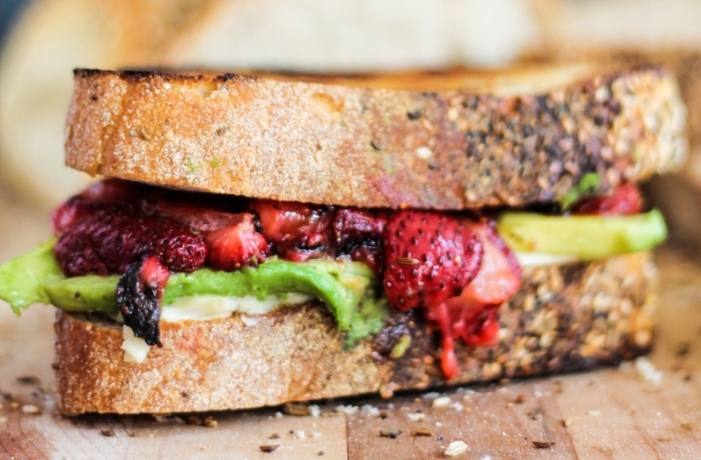 Lay mozzarella on top then add avocado and roasted strawberries. Drizzle two slices of bread with olive oil and place oiled side up on the sandwich. Cover with a lid and cook about 4-5 minutes or until golden brown on bottom. Carefully flip the sandwich, reduce heat to medium and cook a few more minutes or until the bread is golden brown. Enjoy immediately! Makes 2 sandwiches.